Hello everyone! If you have the day off for Martin Luther King, Jr., enjoy it. If not,have a good day with the kiddos! 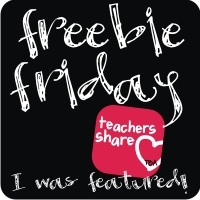 Also, be sure and hop over to Classroom Freebies to see what other people are sharing! Thanks so much for the freebie! Visiting your blog makes me want a cupcake with sprinkles! I just got a custom design by Christi and I love it! She did such a great job with yours as well! Thanks for the antonym game. Happy Monday! Just found your blog and instantly became a follower! Thank you Mary, Melissa, and Polished Teacher! I will check out your blog, Polished (I hear you just switched it up) and thanks everyone for visiting!